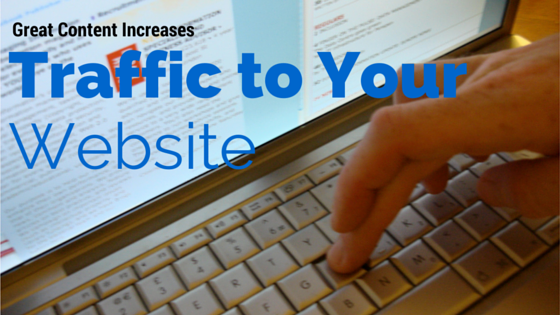 Increasing website traffic is the cornerstone of any successful business with an online presence. While some companies entered the internet-era with an already-established name, others have had to find their way and grow with the worldwide web. For businesses still finding their way, increasing traffic to your website may seem like a difficult journey. But never fear, and never underestimate the power of content. The first step to developing good content to draw traffic to your website is a good headline. Internet readers are drawn to a headline that says it all. In fact, it is best to keep in mind that a headline will be the only thing a reader sees when the article is shared. Websites can increase their views drastically with a good headline, and it is oh so important that the headline grabs the attention. Beyond the headline, content should be of the best quality, as quality articles get better ranks in search results. Be sure the content offers people what they cannot find on another site. Content should be helpful and useful, be it with solving a problem, getting a good laugh, or finally achieving that goal they have been putting off for ages. A good site approaches a niche and becomes an expert in that niche. You want readers to think of your site and go to you first. This can either start with content centered around an interest you have, or you can search around a bit for a niche that hasn’t been talked about much. Whatever you choose, study the niche. Write about it. Become an expert. Your website’s readers will appreciate it and continue to come back. Maybe your visitors will even tell a friend where they found the information in casual conversation. Write content that is shareable because in this day and age of social media, sharing content is oh so important. Making your content easy to share will help increase traffic for your website because your readers will be more inclined to spread the word for you. With a grabbing headline, good image, and a compelling lead-in to the content, you will have a perfect chunk of your website’s content that your readers can share via their social media networks. To really capitalize on the sharing trend, write the content in list form as lists grab a reader’s attention. Keep your content updated for increased website content. Regular updates make it more likely that your readers will come back to your site. It is great to create new content every 2 to 3 days. However, weekly is alright too. Try to aim for at least a few articles per week. An increase in traffic is more likely with a steady flow of content. Don’t underestimate tagging your articles. Tags affect how your content will come up in search results, but they also help your readers find the articles they need. Effective use of keywords is important with this step as well. Search engine optimization helps people come across your website in search engines. It is well worth it to take the time to ask around to see what words come to mind when people are searching for your type of website. Don’t go too far with keywords, and don’t put them inside graphics. Either will make it harder for search engines to pick up on them. setting up an RSS Feed. All of these things are great ways of building links from multiple platforms and will help increase traffic to your website. Content writers probably forget this one, but linking fresh content to older posts on your site can be very helpful. Just be sure that the articles you’re linking are related. This move helps keep new users on your website by guiding them to find articles that would peak their interest from previous months. Don’t hesitate to add links for new posts onto old content as well. Free online classes, live. Live information gets people going and will bring more traffic to visit your website. Free software downloads. Software is not cheap. This move alone will make people think of you, especially every time they use the software they downloaded from your site. This doesn’t have to be limited to software; it can be demos and shareware as well. Free consulting. This one goes a long way. Not only do people like free stuff, be they like when people are willing to help them – for free! Look at what you’re an expert in, don’t be afraid to learn more, and offer help to potential clients in that area. Template for business cards. People use these and print the cards out. Wouldn’t it be great if while promoting themselves, their promotional efforts had your website’s name in the mix? Every time they hand out a business card, not only will they think of your site, but the recipient will be introduced to you as well.